Simply the Harp / About Us / Why "simply" The Harp? 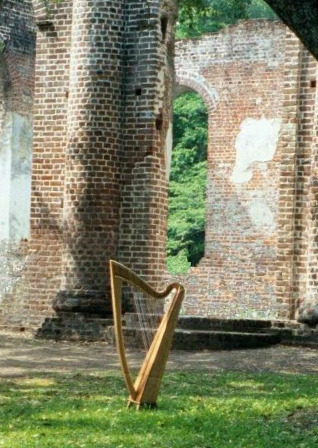 Why "Simply" the Harp? It's about clarity and the lovely sound of the harp itself. All the arrangements are within an intermediate level, with a focus on the melody line and beautiful harmony. It's enjoyable and inspiring to hear sophisticated harp performances. On the other hand, there's a purity and beauty when a harp is played simply- but-well. Hence, Simply the Harp. One harpist said, "Your arrangements frame the melody perfectly." Others have said, "Your arrangements fall so nicely on the harp," or "I always enjoy playing your arrangements, and they are easier to play than they sound." Why are my arrangements published in the keys of C and Eb? Typically, lever harps are tuned in either C or Eb. In order to play in another key (G, for example), you flip levers in each octave. This works well, but 1) it requires making lever flips between songs, and 2) it changes the sound of those strings just a bit. By having the songs in one key signature, you can transition smoothly from one song to another, and it retains the sound clarity of open strings. Plus, you don't have to worry about flipping the wrong levers! If you would like to have a song in a different key, such as to accompany a soloist, please contact me. I can easily transpose my publications into any key and send you the music.